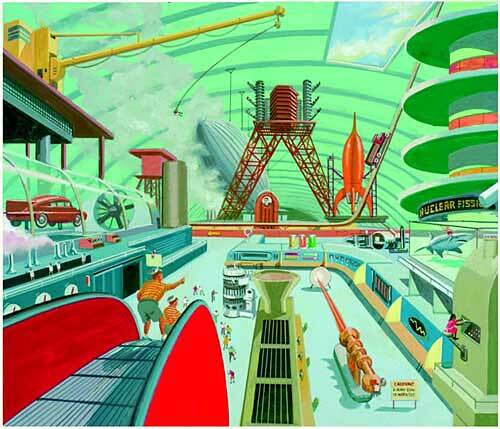 The word “retrofuturism” was coined by Lloyd Dunn in 1983, according to the Retrofuturism art magazine (1988-1993). 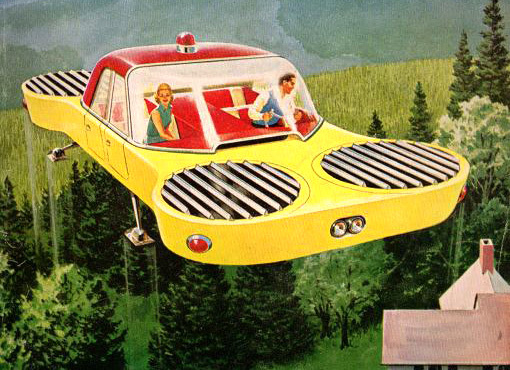 Retro-futurism incorporates two overlapping trends which may be summarized as the future as seen from the past and the past as seen from the future. The FIRST trend, retro-futurism proper, is directly inspired by the imagined future which existed in the minds of the creatives of the pre-1960 period who attempted to predict the future, either in serious projections of existing technology or in science-fiction stories. 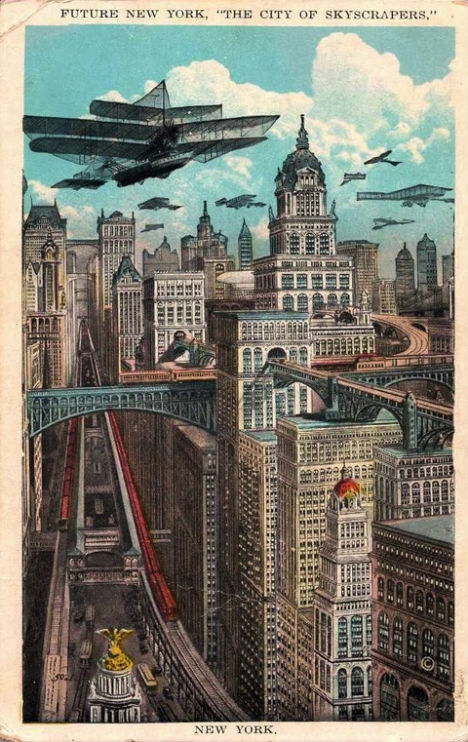 Such futuristic visions are refurbished and updated for the present, and offer a nostalgic, counterfactual image of what the future might have been, but is not. The SECOND trend is the inverse of the first: futuristic-retro. It starts with the retro appeal of old styles of art, clothing, etc., and then incorporates modern or futuristic technologies onto it, creating a shepherd’s pie of past, present, and future elements. For the most part, both trends are hard to tell apart because they have mutual contributions of like visions. Retro-futurism of the FIRST type is inevitably influenced by the scientific, technological, and social awareness of the present, while futuristic-retro creations are never simply copies of their pre-1960 inspirations. Instead, they are given a new, ironic twist from a modern perspective. Both retro-futuristic trends in themselves refer to no specific time. When a time period is supplied for a story, it might be a “what if” present with unique technology, an outlandish version of the future, or an alternate past in which fictitious or projected inventions of the past were indeed real. Although retro-futurism, due to the varying time-periods and futuristic visions to which it alludes, does not provide a unified thematic purpose or experience, a common thread is dissatisfaction or discomfort with the present, to which retro-futurism provides a nostalgic contrast. A similar theme is dissatisfaction with the modern world itself. 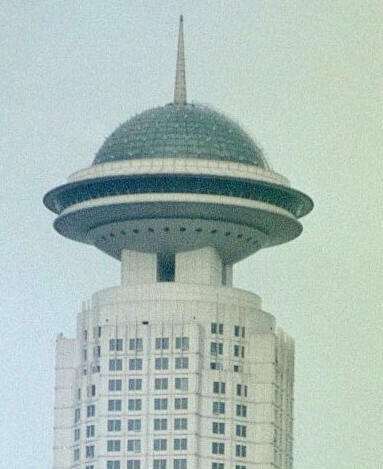 A world of high-speed air transport, computers, and space stations is (by any past standard) ‘futuristic’; yet the search for alternative and perhaps more promising futures suggests a feeling that the desired or expected future has failed to materialize. Retro-futurism suggests an alternative path, and in addition to pure nostalgia, may act as a reminder of older but now forgotten ideals. 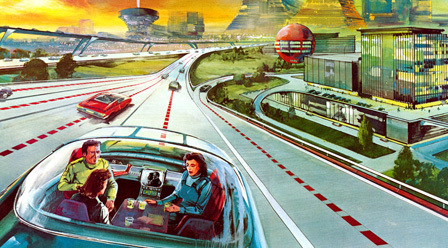 Retro-futurism is not always optimistic, and when its focus is during gloomy periods (i.e. World War II), it may become bleak and dystopian. Therefore, the alternative reality inspires fear, not hope. A great deal of attention is drawn to fantastic machines, buildings, cities, and transportation systems. The futuristic design aesthetic of the early 20th century tends to solid colors, streamlined shapes, and mammoth scales. It might be said that 20th century futuristic vision found its ultimate expression in the development of Googie design. Googie architecture (also known as populuxe or Doo-Wop) is a form of modern architecture and a subdivision of futurist architecture, influenced by car culture and the Space and Atomic Ages. This originzated in Southern California during the late 1940s and continued approximately into the mid-1960s. The most frequented types of buildings designed with a Googie style were motels, coffee houses, and bowling alleys. As Creative Director, for our Holiday Bash Poster piece, I really wanted to use retro-futurism (rather than futuristic retro) with an alternate past as the theme because life is a constant battle between the present and the future – hopes, dreams, regrets, what-ifs, changes. I imagined that the 1960s were a time when technology and space exploration were beyond our years even now, but yet fashion, etiquette, morale, and innocence remain what they really were then. It’s the contrast of living during crazy advancements of technology but yet living a simple day-to-day routine without any full understanding of these surroundings. The simplicities of life – socializing, drinking, and eating – seem unfazed by the realities of extreme technologies. That is quite the opposite of today, since it seems that we are all engulfed in technology (not to mention socializing through technology). I love vintage and retro art, whether it be advertisements, furniture, architecture, or just plain art. I wanted to quickly illustrate the image as if it were drawn by an artist in the 50s-60s era and to add elements of the future of what we have presently in 2010 and make it more fantastic. The poster also has a nostalgic approach to retro-futurism as any fun times a person has will always be nostalgic to them when they see pictures of themselves at that very moment. Our talented graphic design intern, Max Trujillo, brought my vision to life in only 2.5 days between his final presentation and finishing up his graphic design education at Fox College. To spit out a piece like this in 2.5 days is quite amazing. Imagine what we could do if we refined and added details in a stretch of a few weeks.